The Global Volcanism Program has no activity reports for Cabalían. The Global Volcanism Program has no Weekly Reports available for Cabalían. The Global Volcanism Program has no Bulletin Reports available for Cabalían. Mount Cabalían, at the SE tip of Leyte Island, is dissected by steep radial ridges that are moderately to thickly vegetated. A lake fills the summit crater of the andesitic volcano, which has an irregular rim with two high peaks on the southern side. A thermoluminescence date of about 510,000 yrs BP was obtained from Cantoloc stratovolcano immediately to the NW. A radiocarbon date of about 135 +/- 30 yrs BP was obtained from a pyroclastic-flow deposit from Cabalían. Hot springs are found on the E and W flanks. Newhall C G, 2008. (pers. comm.). There is no Deformation History data available for Cabalían. There is no Emissions History data available for Cabalían. 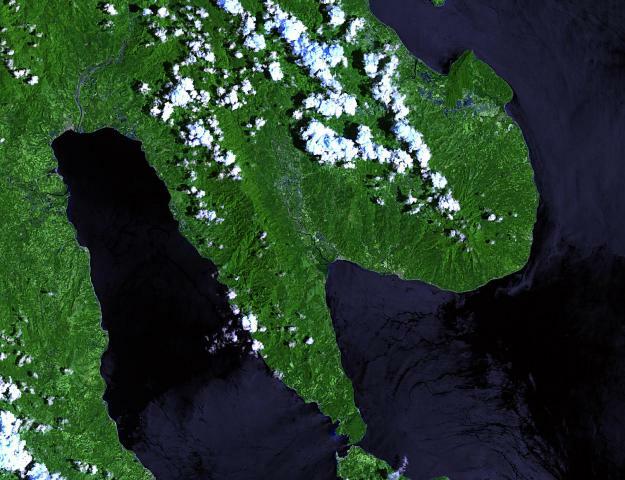 Mount Cabalían occupies the rounded peninsula (right), at the SE tip of Leyte Island, rising above Cabalían Bay (center) and Surigao Strait (right). Sogod Bay is at the left. The volcano is dissected by steep radial ridges that are moderately to thickly vegetated. Cloud banks obscure the summit of the volcano, which contains a crater lake. Hot springs are found on the east and west flanks of Cabalían. There are no samples for Cabalían in the Smithsonian's NMNH Department of Mineral Sciences Rock and Ore collection. Large Eruptions of Cabalían Information about large Quaternary eruptions (VEI >= 4) is cataloged in the Large Magnitude Explosive Volcanic Eruptions (LaMEVE) database of the Volcano Global Risk Identification and Analysis Project (VOGRIPA).